I am considering working contract jobs while employed by a self-owned company. I am on GC-Ead (pending AOS). 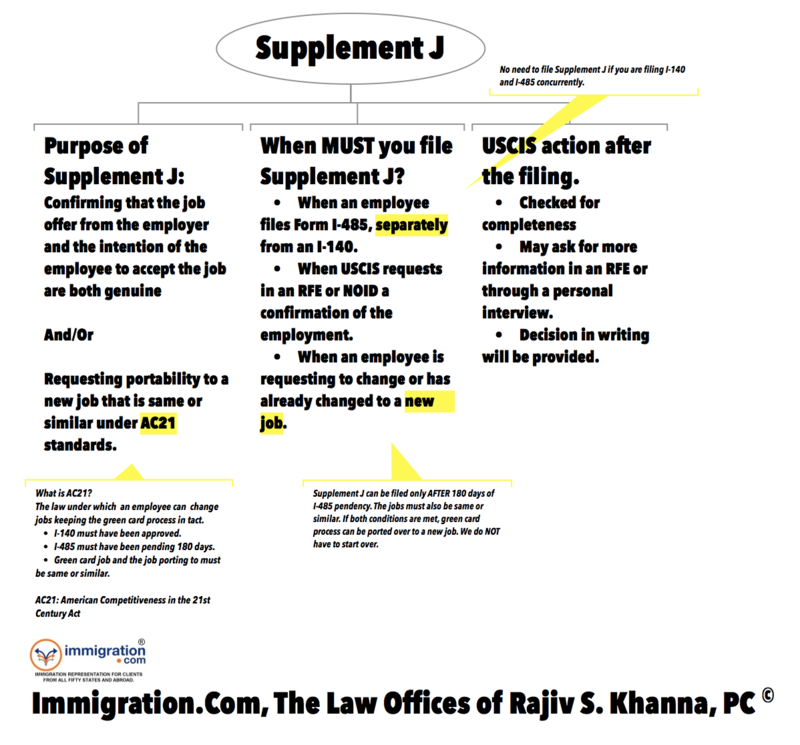 Considering the mandatory filing of supplement J forms in case of job change. Is there potential for rejection? Considering that it will be a brand new company and no turnover at the time of filing supplement J. My EB2 priority date is June 2009. I filed for my I 485 in 2012 and since 2013 I have EAD and have been maintaining H1b status. In 2014 I changed my job from the original employer who started my GC process (with whom I have I 140). I sent AC21 when in 2016 I got the standard RFE to produce medical records and employment proof (since then the priority date had retrogressed again), and also have H-1B with my new employer. I have not started the new GC file with a new employer. Should I file supplement J now, proactively, or should I wait for another RFE from USCIS when my priority date becomes current in the future, to file for supplement J? There is a graph on this about when you must file Supplement J on our web site and what happens after you file. I have approved 140, Green card EAD/AP card in EB2 from company-A and passed more that 180 days. I have maintained H-1B status since last 9 years instead of using EAD/AP as the need to go India for marriage so my future wife gets H-4 easily. Just transferred my H-1B to company-B. Company-A will revoke my I-140 in March 2017 due to company policy. I have following questions to ask you.<br> 1. Shall I get H-1B extension (beyond 6 yr) in future with company-B after I-140 revoke from my previous employer?<br> 2. I have EAD/AP card from my previous employer. Is it required to start GC process like labor and I-140 application again with company-B if my previous employer revokes my I-140? Can a J-2 dependent (Canadian citizen) change to other working visa or have to change to H-4 when J-1 gets waiver and moves to H-1. Basically any hope for a spouse on J-2 to get work authorization (TN/H-1/investor visa) before the 3 year waiver is complete? I was in US from 2003 on F-1. I finished my Ph.D. here and changed to J-1 Status. I want to travel during 2012 summer, but need to go for J-1 Stamping. Do you think it will be a problem? Is there a chance that I might be stopped because of 214(b)? Immigrant intent is definitely a consideration for issuance of J visas. As to whether or not you may have a problem is impossible to predict. If you can have a safety net of an H-1 (if needed), you would be better off. My J-1 at Cornell Psychology Department expired on Aug 31 2011 after 5 years. Currently I'm spending my grace period. I'm exempt from the 2 years rule. I was wondering if it could be further extended. If not, would it be possible for my department to issue a new DS-2019 (J1) instead? I have only been working here for about a year and have been at a different university before. Can I use my J-2 visa for internship and work after completion of FPGEE? I applied for my waiver in Aug 09 from the US and sent completed DS 3035 to the Waiver Review Div. in St. Louis, MO and Indian Embassy in DC. I returned to India in Sept 09.I have not had any updates since then. I would like to know (1) If I have missed any steps and if that is the reason why my waiver status remains unchanged (2) If I HAVE TO and can still apply for the NORI and obtain my waiver since I already have my case number and barcode (3) If I apply for the NORI from India, where do I send the Statement and Affidavit for attestation? (4)Are there any additional steps for waiver from India? My spouse is J-1 and is in US and I want to apply for J-2 to enter US. But 10years back I was denied entry in US on my B1/B2 Visa with I-275 executed stamp on my passport because in my last stay in US I attended college for a semester on B1/B2 visa. So I need to ask are there chances that I will get a J-2 visa to join my spouse? I am presently in Canada on Canadian PR (and have an indian passport). An employer in Indiana (from a hospitality background) is interested in hiring me. 1. They have no clue abt H1B visa. How do I proceed? 2. I was on J1 from 2000 to 2001. I do not have a waiver. Will this affect my application? I was on J-1 visa for 18 months of training in a dental lab as a dental technician .I got my waiver on my J-1 visa .I came back from USA to India and applied for the F-1 visa in a community college .But I was denied f-1 visa on bases of section 214(b) of immigration (possible immigrant).What can I do next to get back to USA? I am on J-2 visa. This is likely to expire soon due to my spouse changing her visa from J-1 to H1.I want to apply for H4 if I can travel outside USA during the application(processing) period. I am currently in the US under the VWP which expires March 15. I was about to apply for a marriage-based GC but I just found out that I am subject to 2-years HRR. I applied for a waiver (no objection). A lawyer told me today that I should still file the I-485 and just leave the question "subject to" blank or check "yes" and add "waiver pending". Is that going to work? I don't want to overstay the VWP. How many days does it usually take to find out that I-485 submission got accepted and I can legally overstay the VWP? I have a R J-1 i am not subject to the two year rule or section 212 (E). Do i have to leave the country if i adjust my status through marriage? I was advised that i should leave the country for at least 60 days and have my interview in my country. Is this correct? I see no reason to leave. The 60-day advice makes sense only if you have just entered USA. If someone came to the US on a J1 visa with a residency requirement of two years and that person returns back to the home country and then would like to return to the US on an F1 visa to continue a master's degree, can a visa be issued before the residency requirement is completed and does the new F1 visa if given, get rid of the J1 residency requirement?